The AC2000 Galaxy Dimension interface enables zones from intruder panels to be placed as icons on the state-of-the-art and highly intuitive AC2000 Security Hub application. 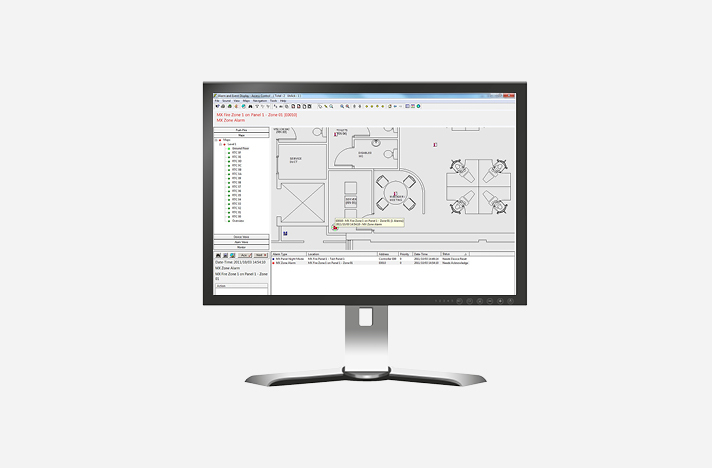 This provides, on a single screen, a graphical representation of the physical layout of intruder sensors and allows for central alarm monitoring of both access control and intruder alarms. System operators can quickly identify an intruder alarm and its exact location on site. This allows for a fast response time and a centralised and integrated viewpoint of both security systems. When the Galaxy keypad is used to cancel Alarms, that cancellation is also sent to the AC2000 security management system; thus simultaenously cancelling the alarms on the AC2000 Security Hub application. This offers operators a high-level, two-way intruder integration. Bi-directional communication between AC2000 Security Management System and Galaxy Dimension control panels.